With the colder days upon us, heavier, heartier foods that warm you from the inside seem appropriate for our recipe section. Peas seem to be in abundance at the local supermarket and make for a wonderful soup. The option of green or yellow peas will let you decide on the colour of your soup (depending on your mood). While green peas have a very distinct flavour and yellow peas are a bit mellower, they both go well with fresh and dried herbs. If you can't find fresh peas when you go to try this recipe, dried split peas will work well (as an added bonus they don't need to be soaked before cooking like other legumes and beans). In a large soup pot, put 6 cups of water and bring to a boil over high heat. Add the split peas, onion, carrots, cauliflower, celery and herbs. Stir and bring to a boil again. Reduce the heat and simmer, uncovered, until the peas and vegetables are tender, about an hour. 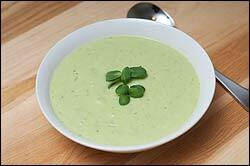 If you prefer a creamy soup, transfer half the mixture to a blender and blend until smooth. Return it to the soup pot and mix well to combine. Stir in your chopped greens into the warm soup and allow them to soften in the pot.